It's Christmas! Well, nearly. All we need to bring on the festivities – apart from copious amounts of alcohol and Brussels sprouts – is a big fella in a red costume that goes by the name of Santa Claus. To get you in the Festive spirit, NORAD, the bi-national US-Canadian military organisation responsible for the aerospace and maritime defence of the United States and Canada (what a mouthful! ), has set up a website where you can track the whereabouts of Santa this Christmas Eve. 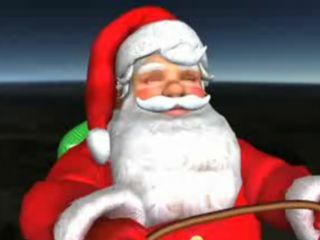 If you want to track the real Father Christmas, then NORAD's website www.noradsanta.org is the place for you. According to its makers, they are charting the elusive present-giver with "ultra-cool, high-tech, high-speed digital cameras pre-positioned at many locations around the world only on Christmas Eve. "The cameras capture images and videos of Santa and his reindeer as they make their journey around the world. Come back to this page on 24 December to see Santa fly!" If you would rather track a 3D version, then you can download an app for Google Maps which allows you to do this. Personally we'd rather wait for him to come down our chimney to cop a look, but it seems times are changing in this hi-tech world we live in.